Germany's Bavaria Yachtbau is offering its customers and authorised dealers a range of attractive price advantages through its new "Economy-Boost-Program' following a major expansion at its Giebelstadt yard. From now until May 31, the company will offer "comprehensive complete packages" and individual price advantages that are described by the company as "not inconsiderable". After a construction period of 10 months and a €10m-plus investment in new production lines and installations, Bavaria's yard expansion in Giebelstadt is now complete, enabling the company to build sail and motorboats of over 15m (50ft) in length. At the same time, the painting plant and further installations have been extended by means of further investments. Bavaria builds round 3,000 sailing yachts and motorboats per year at its production site in Giebelstadt, Germany. In July 2007, Bain Capital funds, together with the company's long-time managing director Winfried Herrmann, acquired 100 per cent of Bavaria's shares. From the 25th to the 27th of March 2009, more than 40 journalists gathered in Barcelona for an opportunity to discover, test and take photos of the full line-up of new Jeanneau powerboats and Prestige motor yachts while under way. Our base for test, located in the lovely marina of Port Ginesta, featured an exclusive assembly of seven models from the Cap Camarat 505 Style to the Prestige 50. The new Prestige 50 will also be available to members of the press and to customers for test sails through May 15, 2009 in the Port of St Cyprien, France (66). 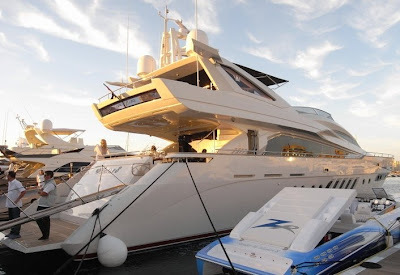 In conjunction with this event, journalists had also the opportunity to discover the design plans, videos and scale models of the Prestige 58 - a new model for 2010, and the first model to be built by the "PRESTIGE Yachts" division - in a special premier presentation. In occasion of a Communication Forum in Rome, at Palazzo dei Congressi, in 26 and 27 March - Intermatica makes the Blu Riband Program promoted by Inrizzardi Group. A partnership confirmed with the collaboration of the two companies, growing up thanks to the synergies in advanced solutions, at not to mention, the friendship of Gianfranco Rizzardi President of Inrizzardi Group and Claudio Castellani President of Intermatica Group. In this initiative other prestigious names take part like: The Bridge, Conte of Florence, Miele, Casale del Giglio, Land Rover, Dom Perignon, Jacuzzi e Santoni. Nastro Blu is a program where Intermatica has believed much showing also great enthusiasm and. For many years Intermatica supplies to Rizzardi the satellite technologies for the installation on board that allow telecommunications from voice, high bandwidth internet, and vessel positioning signal. Advanced technological solutions to guarantee safety, and service in navigation on the seas. Regal Marine Industries in the US has added Christopher Spindler to its sales management team. Spindler, who joined the company in 2005 as a sales and marketing assistant, will handle sales in the northeast area, is stretching from the Chesapeake north to the Canadian border and west to Pennsylvania. Spindler most recently served as assistant southeast regional manager at the company where he supported dealers' inventory management initiatives. In the past, he has helped to develop Regal's sales training programmes and assisted dealers at numerous boat shows around the country. Linssen Yachts, a Dutch producer of steel motoryachts, is to hold a "Linssen Yachts Boat Show Summer Festival 2009" in celebration of its Diamond Jubilee year. From June 11-14, 2009, visitors are invited to inspect the Linssen motoryacht programme in the 9m-16m (30ft-50ft) segment at its yard in Maasbracht. Unlike the company's annual winter show, the yachts will be displayed on water at Linssen's yard marina. Sea trials will also be on offer. The show begins on Friday, June 12, with a Linssen Dealer Meeting for its international representatives. During the day, guests will be able to visit the boats on display and register for a sea trial. Linssen will also present new developments for the 2010/11 model years. Another show and trial day will be held on Saturday, June 13, which will conclude with a party exclusively for Linssen owners. Sunday, June 14 will be the final show and trial day. The evening prior to the opening of this year's Miami International Boat Show was abuzz with excitement during the annual pre-show gala hosted by Marquis Yachts. This highly anticipated invitation-only gathering has become an annual event where Marquis yacht owners, yachting enthusiasts and industry luminaries from around the world gather to see Marquis' newest designs and socialize with others who share their passions for finely fitted yachts. More than 300 invited guests were greeted by Irwin L. Jacobs, Chairman of Genmar Holding, LLC and Robert VanGrunsven, President of Marquis Yachts. On hand during the event was Carlo Nuvolari, principal of Nuvolari-Lenard Design of Venice, Italy. All Marquis yachts are designed by the Nuvolari-Lenard studio. During the evening Carlo hosted personal tours of the new 720 Marquis and the Marquis 500 Sport Bridge. Also in attendance was executive chef and world wine expert Michel Atlas who shared his knowledge of French cuisine and wines and treated guests to Henri Giraud French champagne throughout the evening. 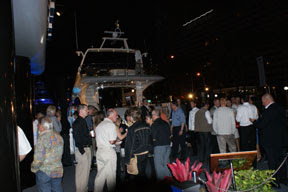 Once again the Marquis Yachts exhibit was the place to be on the eve of the 2009 Miami International Boat Show. Menorquin Charter has been devised to meet the needs of those wishing to sail the incomparable coastal waters of the Balearics and Alicante on board a boat whose unique design concept makes it exclusive, tremendously comfortable and supremely habitable.The Balearic shipyard currently offers all the boats in the Menorquin Yachts range for the Menorquin Charter formula, the range is composed of cruising yachts of between 10 and 18 metres. It includes 6 models (Menorquin Yacht 100, Menorquin Yacht 110, Menorquin Yacht 120, Menorquin Yacht 145, Menorquin Yacht 160 and Menorquin Yach 180) all of which are outstanding for the beauty of their design, the traditional nautical details characteristic to the Balearics, hand craftsmanship and high quality materials used in their construction which confer elegance and warmth to their ample interiors. All of these features identify the Menorquin brand. Both the Balearic Isles and Alicante offer naturally idyllic conditions for sailing, the pleasant Mediterranean climate with mild temperatures for most of the year and long summers, their attractive coastlines with a multitude of small coves with crystal waters make both these maritime environments sailing holiday paradises. Discovering these coasts in a Menorquin Yacht, a boat with great personality and in perfect symphony with the flavour of the Balearic Isles, will undoubtedly be an unforgettable experience. Menorquin Charter is available, since its launch, at the ports of Mahón in Menorca and in the Marina de Denia in Alicante; and recently to meet the popular response of this service, Puerto Portals, in Mallorca has also been added. It is also possible to enjoy Menorquin Charter in Ibiza and Formentera by arrangement through the Marina de Denia branch, either setting sail from here it is possible to arrive at the islands after 4 hours gentle cruising or if preferred it is also possible to board the boat directly in Ibiza or Formentera. For those customers thinking of chartering a Menorquin Yacht for a forthcoming holiday, Menorquin is currently offering a special discount of 15% for bookings made before the 31st of March. Outer Reef Europe brings you a new and exciting opportunity to own one of the most exceptional long distance cruising yachts at a fraction of solos ownership. In partnership with the Global Super yacht Club, Outer Reef once again are at the forefront of bringing new concepts to enable you to fulfill your dream of owning a superlative yacht considered by many as the benchmark Raised Pilot House Trawler. 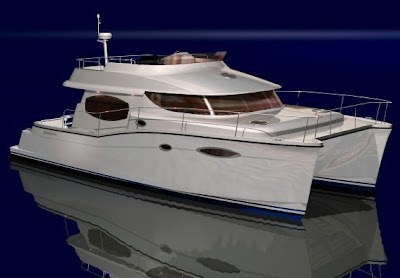 This next Outer Reef 65 shortly to go into build will be highly specified and equipped with every convenience and specification for Mediterranean and beyond cruising. Everything from full air conditioning, generators, fully stabilized, Caterpillar Marine Power, electronic suites, Sat TV and communications, extensive crew quarters, an exhaustive list of equipment with optional, jet ski, tender RIB and water toys. The visit to Nimbus Boats is one of many company site visits that Fredrik Reinfeldt is making throughout Sweden. The Prime Minister is on tour to see for himself the possibilities for jobs and business opportunities during the current economic downturn. At Nimbus they are for example, very dependant on that we are committed to increasing the numbers of skilled tradesmen in Sweden, by supporting the learning of trades in schools and not only concentrating on the academic subjects. It is exciting to see how we can bring together tradesman’s skills into modern automated manufacturing facilities, says Fredrik Reinfeldt. During the tour of Nimbus, the Prime Minister spoke to staff and the boat manufacturer’s Chairman Håkan Larsson got the opportunity to outline the company’s future plans and growth opportunities. I felt that it was very positive that Prime Minister, Fredrik Reinfeldt on his own iniative chose Nimbus at Mariestad when he made his site visit in the region, said Håkan Larsson. When asked if he himself had a boat, the Prime Minister answered that he does not have my own boat, but friends of mine do. So I am one of those that gets invited which I think is great. During the opening day of 40° NauticSud, Naples, Rio Yachts gave two special prizes to as many yachtsman. These prizes want to show a special thanks for the fidelity to the brand. The first, called “High Long Fidelity” was assigned to whom reach the finish of 5 Rio models. This year this prizes is given to Dr. Giovanni Nazzaro, gynecologist that dedicate to the sea every moment of free time with his RIO 35 FLY. He receive the prize from Dr. Luigi Scarani. The second one is called “Replay”. This the motivation: who know Rio don’t leave it, but increase twofold. But there is more: who have done experience Rio do the second purchase in name only, a fidelity proof that deserve a special prize, assign this year to Dr. Carmine Salzano, dentist, that has started his sea life six year ago with a dinghy and later he is passed to a RIO 35 CRUISER and then to a RIO 42 ART. Riviera has reported a healthy start to the Boat Show season following recent boat shows around the world, including Melbourne International Boating and Lifestyle Show and the Miami, Mumbai, Dubai and Auckland International Boat Shows. At Miami, Riviera recorded sales across the line - large and small Flybridge models, Offshore Express and Sport Yachts. The following weekend saw Riviera’s new Dealership in India display at the Mumbai International Boat Show, gaining interest in a range of the company’s models, particularly the new 5800 Sport Yacht that will be launched in May as well as the 48 Offshore Express. Riviera’s first delivery to India was a 48 Offshore Express late last year. Riviera Dealers representing the company at the Dubai and Auckland Shows also reported sales and healthy enquiry. R Marine New Zealand’s Bruce McGill said Riviera displayed eight boats at the Auckland Show, the largest on the water. Tim said the shows are a valuable indicator for the Sanctuary Cove International Boat Show in May. Nearly a year on, Riviera’s Aftermarket Service Centre is proving a major benefit for many clients right around the world. From local Riviera owners wanting antifoul to significant development work, the Centre is bustling. The Centre recently completed a major development on a new Riviera 56 Enclosed Flybridge for a client in the Middle East. Valued at about AU$300,000, the work includes fitting a tuna tower, a hydraulic swim platform, a solid aft bulkhead to the flybridge including stainless steel awning window and door, similar to the Riviera 61 Enclosed Flybridge. Aftermarket also recently completed a refurbishment for local Riviera 51 owners Grahame and Biddy Stephenson. Aftermarket also fitted a tuna tower to a Riviera 43 Offshore Express for a local owner. Riviera’s stainless steel department began making the special towers about a year ago. 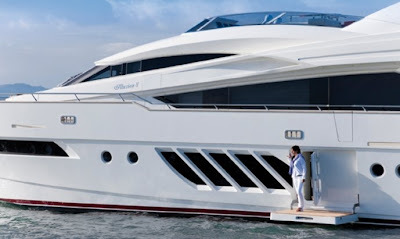 One of the first was installed on Riviera’s own boat the 48 Offshore Express Fascination IV. The Lake Macquarie and Newcastle & Port Stephens Game Fish Clubs shared the honours at the 2009 Riviera New South Wales Interclub game fishing tournament. The Riviera NSW Interclub is the biggest game fish tournament in the southern hemisphere and one of the biggest in the world. This year the event attracted 180 boats and about 1,000 anglers from every game fishing club in New South Wales as well as a number of visiting boats. The event runs over two weekends at the end of February and early March. The Interclub is a teams tournament with clubs entering teams of five boats each. The anglers compete over two weekends for a range of trophies. There are no cash prizes at the Interclub. The Newcastle & Port Stephens club took the Champion Club Tag and Release while Lake Macquarie picked up the trophy for Champion Club Capture. Heading the teams for Newcastle & Port Stephens was Team 2 including Riviera 42 Diversion, Billistic, Born Free, Di-Da-Ke and Gunrunner. Garry said his team has now been part of the winning Interclub team five times, twice on board Diversion. The Interclub Shield for the Champion Club Team Capture went to Lake Macquarie’s Team 2 made up of Ba’ja, Boss Hogg, Kurri Tackle, Head Hunter and Offshore. Champion Boat Tag and Release went to Born Free from Newcastle & Port Stephens while the Champion Boat capture went to Offshore. Shane and Judy Jonathan on board their Riviera 42 Birds of Prey had a successful tournament without featuring in the results. Junior Kate Lamb completed a very successful tournament, tagging four marlin and taking the trophy for most tag-and-release points by an angler, most tag-and-release points by a junior/small fry and most tag-and-release points by a lady angler. 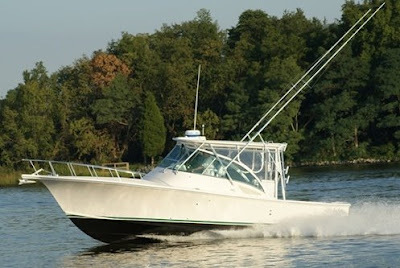 Riviera was represented through the tournament by the company’s gleaming silver-hull 48 Offshore Express Fascination IV skipped by game fish legend Bob Jones. Registered among the visiting boats, angler Lorraine Golightly tagged and released two marlin through the tournament. The Riviera Trophy for a Riviera scoring the most tag-and-release points went to Riviera 42 Running Bear skippered by Duncan Manderson. A total of 149 marlin, 19 sharks and 151 other game fish were tagged and released throughout the tournament. The Polish marine success story, Sunreef Yachts, based in Gdansk begins its eleventh year of trading with positive historical results and expectations for continued strong growth as it builds on its reputatation as the global leader in luxury catamarans, both power and sail. Sunreef was established in 1998 as a charter company and then began producing yachts in 2000 in a Gdansk shipyard. The company delivered its first catamaran, the Sunreef 74 CHE, two years later in 2002 and since has seen sales and operating profit grow consistently along with its range of products and services. Sunreef’s in-house charter agency, Sunreef Yachts Charter www.sunreef-charter.com, now has more than 1000 yachts in its fleet as its own 2008 net sales rose through €1.8 million with a 30 per cent increase expected in 2009. In 2008 Sunreef launched two new yacht models, 70 Sunreef Power and Sunreef 70 Sailing. This year, it will launch its first superyacht Sunreef 102 Double Deck and At the same time, is designing new mega catamarans projects over 100 feet. Sunreef Yachts is actually comprised of three business units: building – Sunreef Yachts, chartering – Sunreef Yachts Charter and Yacht Management employing 450 worksmen and employees, the workforce keep constantly growing at this time. In addition to its production and headquarters activities in Poland, the company has worldwide brokers network in Spain, Italy, France, Greece, Turkey, Qatar, USA and China to name but a few. From 2007 to 2008 Sunreef’s net income from production and services increased 40% from €19,6 million to €27,6 million with expectations for 2009 that this will continue to €33,6 million as annual deliveries pass 12 with 18 scheduled for 2009. Despite a challenging labour market in Poland, this accelerating production rate was achieved by optimising production techniques which for example reduced production time for Sunreef’s most popular model, the Sunreef 62, from 9 to 4 months. Sunreef is also increasing overall production capacity with the acquision of 16 hectares land in nearby Gdańsk Wiślinka for the construction of a new 24,000 square metre purpose-built manufacturing facilities with possible enlargement due for completion and occupancy in 2010. This facility will enable Sunreef to build yachts up to 50 meters in length. Management’s forecast for the coming years is likewise very promising, if slightly more modest taking into account the uncertain world financial situation. Sunreef’s financial plan for 2009 budgets for a 25per cent growth in sales on 2008. To provide its clients with a full range of support services, Sunreef has also established its after-sales service, refit and Brokerage Division which now has more than 800 yachts in its data base. Sunreef's first power catamaran, the 70 Sunreef Power JAMBO has successfully crossed the strait of Magellan in Patagonia, Chile two weeks ago. The first stage of a round-the-world trip in family has come to an end in Puerto Mont, Chile where the Bourgnon family made final preparations and provisions for the second part of this incredible trip. Jambo is now heading Robinson Crusoe Island and Easter Island before reaching heavenly French Polynesia, where a longer stay is planned. After four months of traveling in different, sometimes extreme weather conditions, 70 Sunreef Power proves to be an ideal yacht for far-distance discovery voyage in both tropical and arctic climate. Ten Sunseeker employees went under the razor at 2.30pm today in the name of charity earlier today at the Poole-based boat builders. Comic Relief uses all the money raised through Red Nose Day to give extremely poor, vulnerable and disadvantaged people in the UK and Africa a helping hand to turn their lives around. For the first time since its launch in 1985 the charity has released three different Red Noses - each set to rally the nation to Do Something Funny for Money. Super Yacht manufacturer Sunseeker International announced its support to the 21st Macmillan Dorset Bike Ride on Board its luxury 34-metre yacht in Poole Quay today. (Wednesday 11 March). Some of Sunseeker's 2008 top fund raisers were present on board for the presentation. Nearly £5,000 was raised by Sunseeker Staff last year, the 'Sunseekers 100 Milers' raised £1,500 and 'The Ladies in Lycra' rasied £480. The total raised amounted to £83,122 and this year a target of £100,000 has been set. The 2009 Macmillan Dorset Bike Ride will take place on Sunday 5th July. Cyclists are offered a choice of six circular routes of 15, 25, 40, 50, 60, and 100miles. The event starts in Broadstone and follows the Dorset lanes through picturesque countryside and Charborough Park on the 25 mile ride. Turkish motorboat builder Vicem Yachts has appointed Bruce Livingston Jr as production director of the company's shipyard in Turkey. Livingston, whose career spans more than three decades, has many years' experience in shipyard operation and management worldwide. 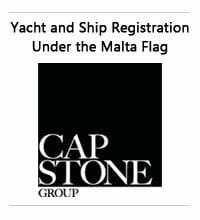 Highlights include time as a project manager for Coddington Yachts in Rhode Island, and 14 years as general manager and supervisor for Little Harbor Custom Yachts' facility in Taipei, Taiwan and its sister entities, Little Harbor Marine Enterprises and Ted Hood Yacht Builders. In this capacity, Livingston started up several contract building and factory operations for Little Harbor in Taiwan, Singapore and the US, and managed all factory operations, which employed more than 200 people and produced over 100 custom and semi-custom sailboats from 13m-23m (42ft-75ft). In1996, he joined Grand Banks Yachts as director and plant manager for the company's operations in Pasir Gudang, Johor, Malaysia, a position he held for close to a decade. During this time, he helped develop the Malaysia facility into the prime factory for the company, doubling production in his first three years. Livingston also designed and built new factory buildings at Grand Banks that increased capacity by 30 per cent and allowed the company to build larger, more complex boats. In addition, he set up a product development department to produce new models and helped establish a sub-contracting department to build all component parts for the other factories in the Grand Banks group. Italian builder Abati Yachts presents the flybdrige version of the 55 Portland, named 58 Eastport, and is expected to be launched in the Summer of this year. 58 Eastport takes the hull and interior of the Portland, adding to it a flybridge up top and in all this taking shape a redesign of the super structure, with a 10 centimeters reduction in height, and more tilted curvaceous forward windshield. The flybridge of the Abati 58 Eastport will feature a central helm station, sunpads on both sides, and to aft a dining table with seating for 8 persons. Accommodation is to be the innovative and private layout as seen for the Portland with a 3 cabin 3 head layout all with a personal entrance. Performance is a max of 30 knots and cruising at 26 knots with twin 800hp shaft propelled engines. 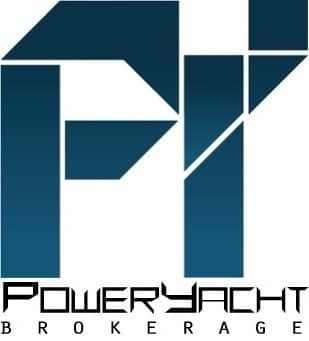 Performance Marine is a renowned Italian fast boat builder, residing on the beautiful lake Como in Italy. Founded in the early eighties Performance success grew as fast as the speed of its highly finished and comfortable boats, becoming an instant reference and one of the most appreciated products in its market segment. Today this Italian built German owned company has a 7 model line up from the small 6 metre 607 to the big 1407 flagship at 14 metres in size. Performance Marine new website is available in 7 European languages: Deutch, English, Francais, Italiano, Espanol, Nederlands, and Dansk. The new Performance showroom has the following tabs which take you to Home, News & Events, Company, Models, Media Centre, Press, Shop, and Contact. The 45 Corsair, is Chris-Craft latest project for a new flagship and is scheduled for official presentation in 2010, and is a natural extension of this historic builder most iconic runabout range. 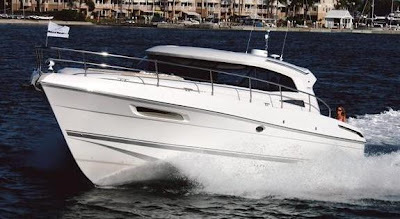 The 45 Corsair, will also offer many innovative features for this range like Volvo IPS technology, a fiberglass hardtop with electric glass roof, and other interesting design elements. Chris-Craft also say that customers can choose between two interior accommodation plans to fit their lifestyle, with a two or three cabin option. Other interesting points are the unique Corsair product quality, styling and features which also adds to this new model exclusive design and size dimension. The 45 Corsair will also have optional aft cockpit enclosure in stainless steel and glass, which can be added with an enclosed cockpit helm area entertainment features. There is also options for a hydraulic swim platform, and hydraulic gang way. Propelled by Volvo forward looking IPS 600 pod drives, having 435hp each the new Chris-Craft flagship is a very important step to this builders range offering exclusive classic sport lines with a European touch for comfort and a unique concept of classiness with all round accommodation. The new Tiara 4800 Convertible is a powerful evidence of the commitment from the US Michigan based builder to a formidable line of high-quality, well-equipped sportfish convertibles. The 4800 Convertible is the second in the line of flybridge Sportfish Cruiser from Tiara, and as the smaller 3900 sibling continues the fishing capable and cruiser viable concept, from its proud bow and sheerline to the roomy well-equipped cockpit. The wide-open design of the cockpit features the always much more requested aft facing mezzanine seating, which Tiara calls a luxury on a boat this size, but one has to give them credit that for minus fifteen metres is not easy to find too. Tiara has a fame for engineering building seaworthy, dry and stealthy quiet riding boats, and the new 4800 Convertible is no less taking you to wherever you want or the fish are Sportfish Cruiser. Tiara craftsmanship is beautifully evident in the impeccable glasswork, as well as the joinery and surfaces throughout the interior. Inside it offers a 7 berth 3 cabin, 2 head accommodation, with the welcoming main saloon offering a wide spacious galley, an l-shaped settee for lounging upon entrance, and a c-shaped dining table. Performance is a fast 36 knots speed with a modest twin 1015hp Catepillar engines, with continuous cruising at 32 knots. Morgan presents its new entry level boat project, the 33 Dinghy which will be launched during the coming Summer. It is an open, almost 10 meters in length, inaugurating a new range of traditional boats called Dinghies, present alongside the Lobster and the Fast Commuters. The 33 Dinghy is a support vessel for both sailing and motor Super Yachts addressing the need of the owner and guests to move quick with a roomy agile boat, but it also proposes itself also as an elegant and dynamic day cruiser. The Aicon Group Morgan Style Center is responsible for the design of the Dinghy 33, whereas the hull was designed by Alfredo Magazzù. In keeping with the Morgan philosophy, the new model succeeds to maintain the founding characteristics of the models of the range unchanged, combining classic taste, seafaring technology, and high performance. On the one hand, the use of the best essences of wood and the most precious fabrics render it unique; on the other, the design of the hull, planned to guarantee maximum stability and smooth sailing even in moderate sea. The helm console, positioned at the center of the boat, is equipped with sophisticated instruments and a hi-fi stereo system including an iPod player. It is covered by an elegant roll bar with canopy, under which, behind the double seater command post, a small galley with stove, sink and bar with fridge can be found. Immediately behind it, in the center of the stern sundeck, there is a five person c-shaped settee with a folding dining table. From the sundeck, it is easy to get into the water thanks to the stern staircase that access to the bathing platform that becomes a real terrace on sea. The surface of the sundeck continues on towards bow and it is protected by a wooden handrail that allows for safe cruising even at high speeds. In this area, below deck, there is a cabin with V-positioned twin beds which can be converted at need into a queen-size bed, equipped with two wardrobes. The bathroom, is located under the center console, with access from the ample hatch at bow of the same console. The 33 Dinghy is equipped with two 190hp stern drive engines, which allow it to reach a cruising speed of 32 knots and a maximum of 38 knots. For those who want more speeds, a twin Yamaha 250hp outboard option is available pushing the small Morgan to a maximum speed of 45 knots. The Dinghy 33 is available with the entire new Morgan 2009 ten color range and a Sport Fishing Kit is also available transforming it into a sport fisherman, without losing any of the unmistakable elegance of the small Morgan traditional cruiser. Windy Boats has delivered its first 52 Xanthos with triple Volvo IPS 600 engines, an innovative new configuration for the truly performance-minded owner. Combining a top speed of 41 knots with rapid acceleration of 0-30 knots in 13.2 seconds, the new triple engine installation produced such exceptional results in testing that the company has decided to offer it as a standard option. Not least because, even with the additional engine, it delivers 20% greater fuel efficiency at a cruising speed of 30 knots than the 52 Xanthos best selling 2 X Volvo D12-800 configuration. Key to the 52 Xanthos improved performance is the low drag design of Volvo’s inboard performance system which, combined with the boat’s deep vee hull, can deliver 40 knot plus speeds, whilst significantly reducing fuel consumption and emissions. The new configuration comprises three IPS600, 6 cylinder, 5.5 litre engines, delivering 435hp, used in combination with two 750mm Humphree Interceptors. Together they offer superb stability and manoeuvrability, as well as reduced noise and vibration levels. Launched in 2006, the 52 Xanthos combines sleek, low profile styling with luxurious three-berth accommodation, and a spacious saloon with sliding doors onto a broad expanse of teak-laid cockpit. Thanks to the newly configured triple IPS 600 version, 52 Xanthos owners can now go further, and faster, than ever before. Starting on the 28Th March and going till the 5Th April is the Croatia Boat Show, now in its eleven edition, an important step for this appreciated East European and Mediterranean location. Happening in the Eastern side of the Adriatic Sea in the Dalmatia region in Split this years show marks an important challenge for the Croatia boat show with the economic crisis shadowing also the nautical market and hurting the many builders and nautical companies, with an expected 5% decrease in exhibition space less to last year. Another miss seems also to be the World previews, although many firsts from the previous Autumn and Winter show are expected to be shown here for the first time. Mustang presented its much waited new 430 Sports Coupe in the end of January, in a special party at its head quarters in Australia. The new 430 Sports Coupe represents a new departure for Mustang, because of its fully enclosed hard top, with electric opening sun roof, and patio door astern, which opens the interior saloon to join with the aft deck. Accommodation wise the Mustang 430 Sports Coupe offers versatility too available in a 2 or 3 cabin version, offering 4 or 6 berths respectively. Another novelty for Mustang is the use of Volvo IPS600 propulsion which increases performance, gives better economy, and makes docking manoeuvring for beginners as easy as its gets thanks to the use it everybody joystick control. Airon Marine presents two important project models aimed to upgrade its line to bigger sizes and more important ambitions. The first of these is the 48 Top Class, upgrading its size by one foot, from the current flagship the A47. My thinking is that the 48 Top Class is also a replacement to the long standing A47. Similar in lines to the latest models like 4300 T-Top and 400 T-Top, the new 48 Top Class continues the requested hard top accessory, offering an all weather protected main deck. If the plans are true to the facts, the 48 Top Class seems to offer very spacious environments, with a big cockpit offering 2 settees, a galley, and helm station. Below accommodation is for two layouts. Version 1 is a 3 cabin 2 head plan, with full beam owners cabin, VIP to fore, and a bunk double cabin to starboard. Version two will give a C-shaped saloon settee in replacement to the third cabin. The 48 Top Class is also interesting for offering double areas, like two c-shaped settees in the cockpit, and two galleys one up top and the other below. Engines and propulsion have so far not been announced. The 53 Top Class is the second of Airon Marine project models, taking the lake Como builder to a new flagship yacht size of 53 feet. What will surprise most to the interested in the new 53 Top Class is the three different interior options, offering a huge amount of choice to the buyer. Something unusual in this size. Version one is a 2 cabin layout, full beam owners, VIP to fore, c-shaped settee saloon to port, and a small galley. Version two very different to the rest goes to a classic plan with owner cabin to fore, 2 sister guest cabins mid ship, c-shaped settee, galley, and a crew cabin. Version three is similar to one with a bunk double cabin taking the place of the saloon settee. Propulsion and engines are Volvo Penta second generation IPS 900 and 800, forward looking pod drives. 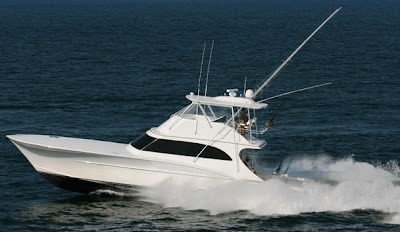 Shearline Boatworks is another of the custom builders coming from the US, most notably the North Carolina region, and here we present its recent model the 61 Sportfish, launched in 2008. This 61 feet flagship is an important step for Shearline, increasing its size from a previous 43 feet biggest offer, but also for being its second flybridge model. As many custom builders Shearlines are also build with the superior cold molding technique, that is structures in high quality wood, and then all covered in glass and lastly epoxied with West Systems. This gives a lighter built but most important also a stronger one to a normal fiberglass construction. The 61 Sportfish is unbelievable fast achieving a 45 knots top speed, and comfortable 36 knots cruise with twin C32 Caterpillar at 1650hp each. 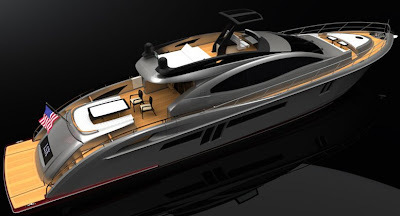 Galeon 530 HT model has been improved with a Wenge Line new interior style. Wenge is an exotic tropical hard wood from Africa, dark brown almost black with tan lines. The Wenge furniture on the Galeon is veneer meaning a sheet of natural wood adhered to natural density fibreboard. Along the renowned and much famous dark natural wood, the 530 Hard Top has also been improved with new quality elements like stainless steel, huge glass sliding doors and white leather upholstery. To accentuate also the dark tonality of the woods the walls are plastered with a silver fabric lit with LED lights. This new distinctive look is a modern departure to other more classical styles like cherry wood or mahogany interiors, and should distinct the client who prefers the latest style in the interior of his Sport Yacht. A new flagship from US fast boat builder Nor-Tech, who with the 80 Super Performance Sport Yacht expands its line to 30 feet, from a previously bigger offer of 50 feet in both its V-Bottoms and Catamarans line. As expected the new Nor-Tech Yacht is all about speeds touching a 52 knots top speed performance with the smaller engine option. This is a super fast boat and I really cannot imagine its speed with the bigger twin 2400hp MTU engines option. Or may be I can think that would be around 70 knots plus. None the less down below the new Nor-Tech Yachts line wants to keep this title and offers comfortable accommodation offering 7 berths in 3 cabins. Quickutter rope cutters are a revolution in propulsion safety, with a new innovative shaver design representing a significant improvement over all other cutting devices. The superior advantages of a Quickutter versus other rope cutters are that you have no loss of power, no bearings, no shock loads, and no cavitation. In four years of fittings only two have required spare parts, and only one has been broken. How is that for customer satisfaction! Fitted mostly to commercial crafts from fast fishing cats to ferries, now the leisure market is increasing its use too, from famous production up to one off builders taking advantage of the protection benefits versus other similar systems. They are also supplied for surface drives and work, sitting on top of the unit so aren't even in the water when running at speed but still cut mooring lines when you run over them whilst docking. QuicKutter is the only make of shaver cutter offering a new approach to an old problem. The new Judge 35 Express is based on the classic that has become the 34 Express for this American builder. Presented officially last month during the Judge Yachts 5th Annual Open House, the new 35 Express in fact is based on the warped hull design of its descendant, having deep forward sections and flatter dead rise aft for a stable fishing platform. The 35 Express is easy recognizable to the 34 Express thanks to a brand new custom windshield offering superior wind protection, better visibility, and a more silent navigation. Accommodation below is for a convertible v-shaped settee with centre table which becomes a comfortable double berth. Other refined cruising amenities is the galley to port side and shower head to starboard. Power for the 35 Express is available with Cummins starting from a single 480hp up to a combined 760hp setup. The new Judge 35 Express is also available with Marlin or Tuna Tower for the serious game fisher. Italian builder Alfamarine presents the project for the 60 HT. Already under construction this new model is expected to be presented in the fall of this year. The new 60 HT is a modernization of the 60 Alfamarine launched in 1997, and before this version flagship of the open range. With this new interpretation the 60 gets the addition of a hardtop, a new cockpit layout, modified stern, and wide view port hole windows. For this new improved version Alfamarine Fazioli family used designers Andrea and Maria Bacigalupo exterior, and Michela Riverberi who retouched the 3 cabin interior to a modern flavour with echoes of ancient Rome. For the propulsion the 60 HT stays true to its hull shape, with twin MAN 1360hp engines propelled with surface drives giving a 45 knots top speed. 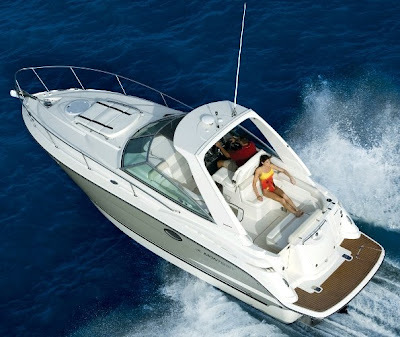 The much anticipated Formula 240 Sun Sport made its debut at the 2009 Düsseldorf Boat Show in Germany. This new addition was a main attraction at the Formula display, offering big fun in a small package. John Adams, Formula’s exclusive designer, took the family favorite 240 Bowrider and included all the features one would desire in an entry level cabin boat. The 24o Sun Sport has a beam of 8´6˝ and a deadrise of 20°, resulting in a roomy cabin and a safe, smooth ride underway. 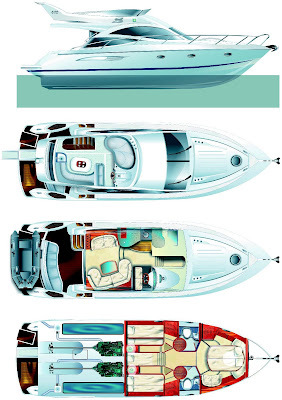 The 240 Sun Sport cabin features a U-shaped forward double berth with filler cushion and custom-patterned carpet. A high-gloss Deep Cherry entertainment center with Corian surface and two polished stainless steel cup holders houses the hifi stereo. Music plays through two 150W two-way marine-grade speakers with polished stainless steel grilles. The head is concealed beneath the forward berth, and a hanging locker is standard for storage needs. The cabin is available in your choice of Morning Sand or Sapphire Blue décor, with custom pillows as standard. Single stern drive power, with 13 engine options from Volvo and Mercruiser starting from 5.0 litre up to the big 496 Magnum completes the package of the new entry level Sun Sport model. The Rampage 34 Express with IPS and sport fish mode is proving outstanding in both performance and maneuverability. The revolutionary Volvo IPS propulsion system dramatically increases power and is more fuel efficient than the conventional inboard model. Tony Martens, director of Product Development and Engineering for Rampage Yachts, has spent hours making sure this new technology gives the Rampage 34 Express impressive results. The Rampage 34 Express contains all the features from the standard shaft version, with the added kick of IPS and sport fish mode. Turkish builder Vicem introduces its latest model in its Classic Series, by debuting the new 52 Classic Express. The new 52 Classic Series is the latest in the range of timeless yachts, with versatile pleasure crafts hallmarked by elegant hull lines, luxurious yet casually inviting accommodation, and a traditional design that makes them real head turners wherever they go. This latest Vicem features a modified V-hull design and has been updated with several important features designed to enhance cruising enjoyment. The helm station is equipped with a starboard helm door to facilitate access between the steering station and starboard walk-around deck, while the station floor was raised for better visibility. A powered sunroof offers the boat’s operator and guests the opportunity to enjoy basking in sunlight the comfort of Vicem’s luxurious main salon. 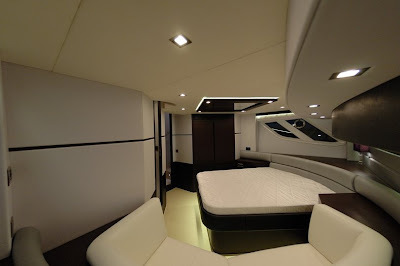 The extension of the forward bunk cabin top represents a significant change to the yacht’s housing arrangement by providing more headroom in the forward part of the master stateroom. Power options start from the small twin Cummins of 640hp up to MAN of 800hp engines, which give max speeds from 30 to 35 knots from the bigger option, with a range at cruising of about 300 nautical miles. Lazzara aims to launch the new LMC 76 in June of this year. This new Lazzara Motor Cruiser design is a departure from the last two launches. The LMC 76 introduces some amazing new technologies. First, it will be the only Motor Yacht to use the triple CMD Zeus Pod systems. The benefits of this type of system are endless but better fuel efficiency, increase interior volume, and reduced noise and vibration are just a few. Second is the debut of the all glass main deck. This main deck has windows that extend from ceiling to floor and wrap around three sides of the main deck. The beauty of this all glass main deck gives you unobstructed views to all of your surroundings. In addition the flybridge will be the largest in its class, even longer than the current smaller of the LMC line the 84. Here are the latest renderings of the new LSX 75 Fly that will debut fall 2009. Some of things you will notice right away are the addition of the flybridge level, the larger aft deck seating and the new foredeck seating group. This yacht will be a great addition to an already exceptional product line. The flybridge which is the real novelty for this new Fly version of the succesful LSX 75 will have a large sunpad aft, seating group and a full navigational helm. According to Lazzara the flybridge will be bigger to other similar sized Sport Yachts in the market. The aft deck sunpad that is on the LSX 75 is now converted into a U shaped seating group, making the seating capacity much larger as well as giving you another 3 feet of floor space on the aft deck. Of course since you have the large sunpad on the flybridge you wont all together loose that feature. The foredeck seating group will have a very large settee along with two smaller tables and a sunpad forward of that. This area has become increasingly popular as a place to gather for lunch or afternoon cocktail. Monterey Boats continues to grow their cruiser lineup with the new 280SCR Sport Cruiser. The new cruiser, one of three 2009 debuts, has an overall length of 29 feet and an expanded, spacious and comfortable beam of over 9 feet. Monterey has also added the popular option of sun island aft seating, in addition to the standard box seating configuration. You can plot a course for your destination in Monterey’s new 280SCR Sport Cruiser thanks to the gel-coated gray dash housing all of the necessary instrumentation at the ergonomically-designed helm station, along with a comfortable companion seating arrangement featuring flip-up thigh rise and a convenient fiberglass storage compartment underneath. The helm also stays cool thanks to an extraordinarily designed air duct that feeds from the cabin. The cockpit also features an expanded entertainment center with optional refrigerator. Access to the engine compartment is a breeze with electronic engine hatches, and plug-and-play wiring makes service hassles a thing of the past. A home away from home is the best way to describe the cabin, which can accommodate thanks to its ample space, storage and sleeping arrangements throughout. Cook meals with the fully-appointed wood-trimmed galley and enjoy them at your dinette table, which easily stores back away into its dedicated storage compartment. You can also enjoy the optional Sirius Satellite stereo package, monogrammed linen and dinette set with silverware and 15” TV/DVD player. 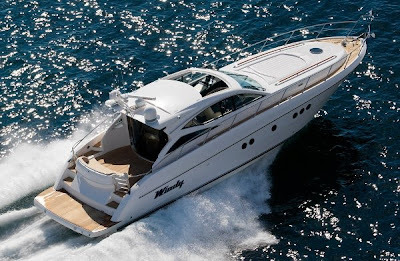 Launched in 2004, the 440 Fly by Galeon was the continuation of quality improvement from this Polish builder, as started in the turn of the new millennium. Trusting in renowned boat designer Tony Castro, the 440 Fly was an important player in the quest of up scaling its line not only in size, but also in finishing and space. Delivered in 75 examples as of January 2009 the 44o Fly has also other interesting stuff, like a 7 berth 3 cabin 2 head interior, top speeds up to 35 knots with the bigger engine options, and a good looking exterior line taking bits and peaces from other renowned European builders but still looking a Polish Galeon all the way. The 440 Fly offers an interesting accommodation package, with its 7 berth lower deck unique for a 13 metre flybridge motor cruiser. Upon entering inside via the stainless steel patio door one is welcomed on the main deck saloon with a c-shaped settee to starboard, opposite is another settee, and forward of this a double seated lower helm station. To port side, and up two steps one finds the raised galley which presents itself in a welcome airy environment and is also among the most spacious for a boat this size. Below not loosing a millimetre of space is all reserved to night accommodation offering none the less 3 cabins 7 berths, and 2 heads. Example to this is the forward ensuite owner cabin with its queen island berth offering a relaxing 2 person couch on the starboard side. 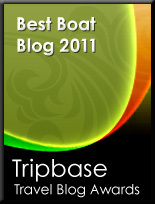 In the central part we have the two guest cabins, offering a double berth, two sister berths and an extra bunk berth. To starbaord in the middle one finds the guest head with cubicle shower. Outside the offer is for a big settee on the aft deck. While on the flybridge we have a c-shaped settee for 5/6 persons looking aft to starboard, forward to this is a dual seated helm station, and to port looking forward we have a double seated sun pad. The forward deck part is reserved for a vee shaped sun lounger. 3 engine options are offered from Galeon with all giving important 30 knots plus performances. The engines for the 440 Fly are located centrally, propelled with direct shafts, and in tunnel propeller pockets, giving in all this an on the plane speed of 18 knots. The top performance is from the biggest twin D9 575hp which give 35 knots max, making the 440 Fly among the faster in its size. For not so speed lovers the other options are the smaller D9 of 500hp, and the efficient D6 435hp, this later choice giving also an impressive speed of 32 knots thanks to unbeatable weight to power ratio. Hull design is by Tony Castro renowned for his offshore designs. Here Castro presents a planning warped shape with deeper forward vee and moderate aft sections for better comfort at low speeds. An IPS propulsion option is also on the works and we wait for Galeon to disclose more information about this. Conclusion There are two types of customers in this size those who trade up and those who are starting there boating adventure. The first are usually looking for more cabins and berths, and the second usually attract themselves to the luxury. So far the 440 Fly seems to hit both these offering a non superfluous rich boat with substance. Meaning it does not sacrifice accommodation berths, speed, and not well positioned engines. Yes engine position which the more located at the perfect part of the hull the more a sea keeper and lower planning a boat it is, offering better rough weather solutions. As for those who are trading up from a smaller size the 3 cabin 7 berth interior is enough for them to rethink of the Tony Castro designed Galeon 440 Fly. The recently launched Pershing 115 features a significant innovation which makes her stand out from other similar sized yachts as well as previous 115 builds. She has, in fact, been strengthened by a new generation Vericor TF50 gas turbine, able to create a power of over 5100hp, with a central hydro-jet thrust. The result is an improvement in both performance, with an equal overall weight, and resistance to significant stress. This technology, typical to aircraft, is rarely used on yachts due to its complexity and the cost of the individual components. In fact, its use requires special accessories, mechanical parts, and technologies incorporated in the entire system such as the titanium exhaust, and the reduction unit. Another huge advantage of this structure is that the yacht is quieter with no vibrations, even at a top speed of 52 knots! A host of other different features characterise the new yacht, making her unique. A very special wood - frise sycamore maple has been used for all the furniture, which includes an innovative LED lighting system integrated and concealed within and throughout the interior. 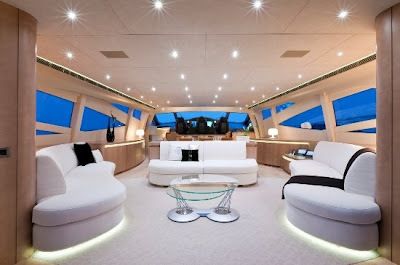 The interior of the yacht is illuminated using warm led lighting in order to make the various environments more inviting and reducing the tiresome overheating produced by traditional halogen spotlights. A waited debut for the new Dominator flagship, the 29M. Team 4 Design along with Dominator Engineering Department, projected the new 95 feet flagship, current biggest model from this Italian builder. Team 4 presents an interesting exterior with aggressive accents for a sporty profile, with a distinctive design thanks to the amount of big view windows, on the lower deck as well as on the upper. Other innovations for the new flagship comes for the retractable bathing platform aft which when open extends to double the size, and the opening terrace on the portside of the full beam owners cabin. The accommodation all located on the lower deck follows a conventional 4 cabins layout: full beam mid ship owner, VIP to fore, and two guest cabins in between all with en-suite heads. Though the bathroom for the owner and the position of the VIP cabin, which feels as a full beam are also a bit unusual in concept and design to the competition. Crew cabins and lobby is located midship. Another big environment for the 29M is also the flybridge area, having huge amounts of free spaces, thanks also to the tender garage located aft on the lower deck. Thanks to Jimmy the Builder who provided us with the 3rd photo from the Dubai show. Delaware custom Sportfish Yacht builder F and S Boatworks presents two interesting 54 feet express boat projects titled 54 XPW and 54 XWS. 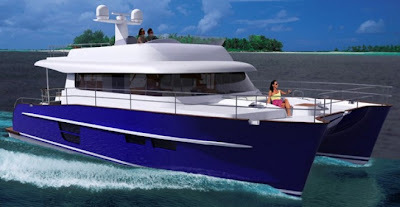 Pictured above is the 54 XPW and the first thinking that comes to sportfish custom build followers is that this project seems to break the usual traditional rules thanks to an usual innovative modern looking upper deck design by Applied Concepts. It would be interesting to know if this wheelhouse is closed or not and what sort of propulsion and engines will the 54 XPW offer. The 54 XWS is the second project and is based on the same lines as the 54 XPW, but carrying a stylish raised upper helm tower for big game fishers. Now many towers don't look stylish but here seems that the Delaware custom builder, and again Applied Concepts are on a roll, and if for real this will look good as the picture above it really can put some steam to some creativity in the express sportfish market. Good news is that one of these 54 Express has been sold with scheduled delivery for later on this year. She will be hull no.15 and will be the third to be named True Grit, which seems to be a hard following owner to F&S and Jim Floyd custom cold molded builds. The Princess V42 goes into its third generation, what is now a complete new version for this successful sport cruiser from this renowned British builder. The V42 has 9 years of age, appearing in the year 2000 and so far until this new 2009 version was always a further development of the V39 presented in the fall of 1994. Princess now with this new V42 want to distinguish itself in many aspects to the previous 2 versions. Among the noticeable improvements one finds is the size, now wider and longer with an over all length of 44 feet, we have also a second en suite head in the mid ship guest cabin, hard top or full open version option, and last a completely redesigned cockpit offering among the top space in its size. For the new third generation V42 Princess decided to stay with efficient stern drive propulsion, offering three Volvo engine options, from the smaller D4 300hp up to the bigger D6 370hp option. Top speed is an estimated max of 38 knots with the big D6 choice. 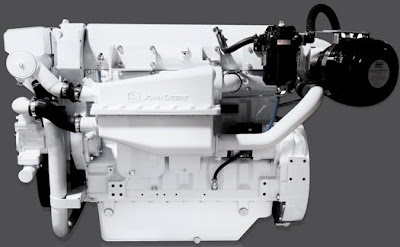 John Deere Power Systems announced and displayed its newest marine engine at the 2009 Miami International Boat Show, the past February. The PowerTech 6135SFM75 marine diesel engine is the newest addition to the John Deere lineup and boasts up to 559kW - 750hp. John Deere is excited about the introduction of the new 6135SFM75 because it is by far the most powerful engine produced by this US marine engine manufacturer. The next most powerful John Deere engine after this is the 6125SFM75 at 455kW - 610hp. John Deere launched this new 750hp addition after many customers requests asking for more powerful engines. The new PowerTech 6135SFM75 has 13.5L of displacement and is a 6-cylinder, electronically controlled, turbocharged and air-to-sea water aftercooled marine engine. As all recent John Deere releases the PowerTech 6135SFM75 meets EPA Tier 2, EU emissions requirements, and is MARPOL Annex VI compliant. Jeanneau 815 Merry Fisher IB is equipped with equipment that is equally well adapted to cruising and fishing, in a small entry level size. For cruising, the new Merry Fisher 815 offers two distinct living spaces: a large saloon and a forward cabin in a spacious and well-balanced interior layout. The large volume of space on the interior can accommodate four person, a family or two couples, featuring a generous forward cabin with a double berth and a saloon that converts into a second double berth. The enclosed helm station offers a bench seating. Fountaine Pajot presents 2 project models set to increase its Power Catamaran range in size and in offer. The first of these is the new flagship 55 Queensland, build on the experience gained with the 46 Cumberland, current biggest model. The 55 Queensland includes everything you could think in a boat of much bigger dimensions most of all as any catamaran is the immense salon combining lounge, dining room, galley and navigation room all this in a refined, luxurious atmosphere. Outside living areas continue the feeling of space with a huge flybridge combining outdoor galley, salon, sundeck, and the helm station. Fountaine Pajot also says of impeccable sea keeping for the new flagship with good waves absorption at speed, but also no rolling at beam seas or at anchor, easy manoeuvrability with dual engines, and last advises a 40% reduction in fuel consumption thanks to careful wet area study. Giving example of this are the power numbers which with twin 2 x 435hp Volvo D6 engines give a range of 1300 nautical miles at 11 knots, with this reduced to 460 nautical miles at the maximum cruising of 20 knots. 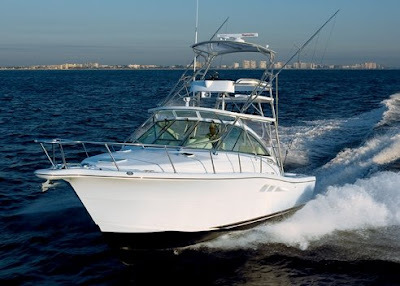 If one desires more power a bigger engine option of twin 670hp D11 Volvos giving a max of 26 knots is available. 55 Queensland lower deck is a three cabin head version, with full starboard hull use for the owners cabin, and a crew cabin forward on the port side. The other project model is the 40 Summerland, which will sit in the middle of the range between the 35 and 46 models. Designed for cruising, this new project wants to offer great comfort in terms of navigation and life on board. Its open spaces free of obstacles, sheltered cockpit and direct access to the flybridge make for easy sailing. The flybridge offers a sundeck, wide seats and an outside helm. Lower deck continues the theme for an open environment with light and comfort, with a saloon offering a dining area for 8 persons, and an easy access galley. Two passageways on both sides take you to the lower decks. The starboard side has the owner cabin fitted with a bed across and view out to sea, desk, dressing table and a private bathroom. To portside, two other fine guest cabins with double beds or twin beds, a shower and storage spaces. 40 Summerland also benefits from the incredible autonomy and range of what Fountaine Pajot calls the trawler catamarans, I would say not much trawler accept for the range and a lot of catamaran for the extra space. Performance data with twin Volvo D3 160hp is an 18 knot maximum speed, and top cruising of 13,5 knots. Range is an impressive 1000 miles at 7.5 knots burning less to 11 litres per hour. A builder of extremes or not? This is the general thinking for Sealine, the British builder who in the nineties was the most adapter of all round bubble shaped designs, continuing with this strategy up to a few years back. 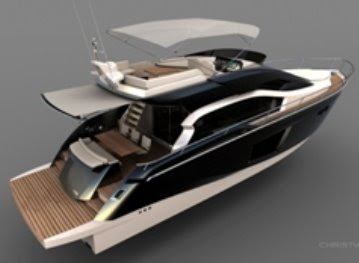 Come 2 years ago and Sealine showed a minimal model with the SC35, and now it presents the F46 project first of the flybridge series to integrate this new modern design approach. The first rendering pictures, show a very extreme minimal look. Inside the novelty continues with a light filled two big cabin interior, mid ship full beam owners, and VIP to fore. Interesting is the galley and dining area setting below which is a light filled environment taking this from the lower helm windows. Upper saloon also welcomes you with 2 l-shaped settees, and the patio door is pivot opening, making here a single area with the aft cockpit. Flybridge setting is a central helm station, c-shaped sun lounger area forward to this, and a c-shaped settee on the aft part. Propulsion is pod drive with power options so far not being announced, but I do imagine similar options to the SC47 with Cummins Zeus of 425hp and 480hp and Volvo IPS600. Being a Brunswick company I would go blind folded for a Zeus Cummins aft looking pods setting as I am sure its hull will be mostly tested with this. Designed by Humphreys Yacht Design the innovative new Kha Shing 76 Monte Fino is developed with European Italian looks, and an owner operator in mind for what regards its comfort. Kha Shing equips its new model with a full list of standard equipment like stabilisers, thrusters and a host of other stuff leaving the choice to the owern for personalisation with a wide range of interior finishes and layouts. The 76 Monte Fino is also available with optional hardtop and forward tender garage, allowing in this case full use of the flybridge. Lower deck offers a standard layout with a 4 cabin 4 head plan: mid ship central owner cabin, vip cabin to fore, and two double guest cabins in between. Aft is a 2 berth crew room with shower room. Power is from twin MAN CRM of 1360hp each. The ever attentive and improving Sessa Marine, take off its flybridge range set to present its first model the 52 Fly in the coming Genoa Boat Show next October. Sessa has 4 total models in plan for the new range from 45 to 70 feet, to debut them in a 4 years period, with a new name to be announced soon. The design for the flybridge range is by Christian Grande who continues his work for Sessa as the recent models from this Italian firm. Here Grande presents a very sporty flybridge yacht, offering a rounded design with sharp edges associating a performing attitude reminiscent of sports cars from the fortys and sixties. Other important aspects of this range is the propulsion with all models set to be powered by Volvo IPS, but also the interior is set to offer something fresh from the competition with a 2 galley plan but also a layout associated for long time live aboard solutions. The 52 will be powered by the 2nd generation Volvo IPS850 pod drives. An other interesting feature will be its presenting color of white for the edges, and a bronze color with metal inserts for the rounded parts. AB Yachts presents its new 92 Fly. Many would think that this new AB is just a Fly Sport bridge version of the 92, but it is not so having this new model longer and wider hull dimensions. It is good to know that the principles of this builder of making a new hull per design still exist as at today. So far little information is available about the interior layout but being all AB Yachts custom builds, it is and can be anyone guess really. The flybridge for hull number one offered a central helm station with 2 seats, and two sun loungers one to fore of the station and the other aft. As usual for this Viareggio, Italian builder what will for sure be is having among the best in Jet propulsion performance and handling, but also high speeds in this case a 48 knots max. Construction is in sandwich with latest and best weight to strength materials: epoxy based vinylester resins, Divinycell coring, and Kevlar fibre, all applied with vacuum bagging technique. The new Coronet 350 Weekend which is to be the new flagship from the Danish builder signals a modern timeless design but also a keeping with smaller models of the range in particular the latest release the 290. It will also ensure recognisable looks to the old legendary Coronet models in the hull lines, and similar to the new ones with the upper structure. Coronets want to perceive the new model as having an exclusive look to the range, presenting a modern retro touched all weather hard top sport cruiser developed on the concept of the 290 Weekend. So far little details are available but we know that it will be a twin engined with stern drive propulsion. The cockpit aft deck will also offer a clever layout as seen on the 290 with an l-shaped settee all covered under the hard top, and a small sun lounger aft. 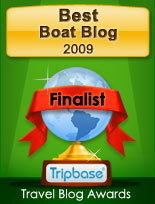 Since its founding in 1991, Cabo always had the vision to be among the top builders sportfishing yachts design. This manifested itself in the fall of 2005 with the launching of the industry’s first production 52 Express. This colossal Cabo immediately became the battlewagon of choice for express devotees looking for more room and range in an open yacht design. Soon after the early success of the 52 Express, other production manufacturers began to plan and build their own versions; however, Cabo has maintained its reputation for superior performance, construction, fishability and design. Now, in the fall of 2008, at the behest of serious anglers looking to accommodate even larger teams over longer periods of time, Cabo raises the bar again with the introduction of a three-stateroom/two-head optional layout for the 52 Express. Cabo's acclaimed balance between functionality and beauty is clear throughout the accommodation spaces. The interior of this newly re-designed 52 Express is typical of Cabo Yachts' unmatched standards of quality and understated luxury. In every Cabo, fishability is both a focus and critical component. To that end, nothing about the cockpit or helm deck has been changed. Even better, there have been no compromises below deck. The new 52 Express three-stateroom layout does not rob space from the heart of this beast, the engine room. Still capable of harnessing twin CAT C32s for 3,100 total horsepower, it is obvious that performance and range are still the backbone of every Cabo. MTU, one of the world’s most advanced diesel engine technology and systems providers, debuted its newest Series 2000 marine engine at the Yacht & Brokerage Show in Miami last month. This newest version of the Series 2000, the M94 boasts the highest horsepower in its class and an improved power-to-weight ratio. Horsepower has been increased by up to 8% over the previous Series 2000 marine engine. The new power output ranges from 1193 kW (1600hp) up to 1939 kW (2600hp) at 2450rpm. The M94’s increased horsepower and excellent power-to-weight ratio was achieved thanks to MTU having the key technology know how in house: turbo charging, fuel injection and engine control. Turbocharger selection was optimized for fuel consumption at cruise speed and its ability to generate higher boost pressure at lower engine speeds. This is one of the major advances for a reduction of a vessel’s acceleration time. Another strong point of the MTU Series 2000 M94 engine is that it not only conforms to worldwide emissions standards, including EPA Tier 2 commercial and IMO, but also comes standard with SOLAS (Safety of Life at Sea) certification. It features double wall fuel lines and triple wall water cooled turbocharger and exhaust routings that keep the engine surface temperature under 220° Celsius. This low engine surface temperature is not only a matter of safety, but a matter of comfort as well translating into a comparatively low engine room temperature. The M94 has also been engineered to be a quiet engine, with one of the lowest sound pressures, even at idle or slow speed operation. The M94 will be available to customers in 10 and 12-cylinder configurations beginning in March, with the 16-cylinder to follow in May. An 8-cylinder configuration will follow within this year.